Burned timber being skidded into the landing. The race is on. Salvage operations on the Ponderosa Burn are now underway. They race to harvest the fire killed timber and deliver it to the mills before it breaks down, and loses it’s value. The small landowners managed their timberlands to provide additional income, maintain healthy timber stands, and create an attractive forest. This fire has changed their management plans. If they don’t recover the value of the timber they will have no money for reforestation. 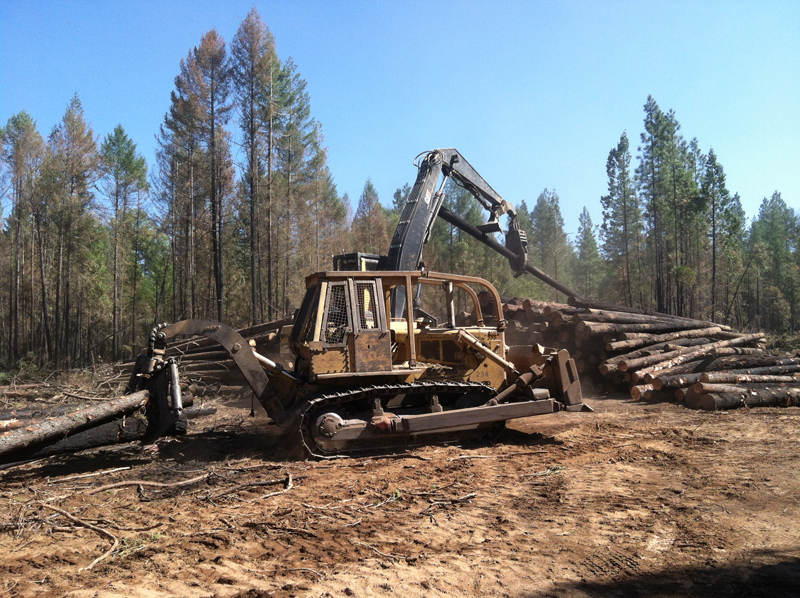 The large timber companies will replant their lands as a part of normal operations. Replanting fire damaged timberlands in California is not required by law due to the massive cost it represents. The timber companies replant after these fires because it is good stewardship and good business. The landscape on the big canvas is being repainted as this latest transformation begins. Fire was the first paint brush to change the canvas. Men and their machines are the next one. A load of fire salvage poles arrives at the mill. This entry was posted in Forestry, The Foresters Canvas, Wildfire and tagged canvas, fire salvage, forest, forestry, landscapes, Ponderosa Fire, salvage, timber, timberland, wildfire by foresterartist. Bookmark the permalink. It is so good to see trees still being put to use, after such fires. Yes, fortunately the private timber will be salvaged. Unfortunately, very little for the Forest Service timber will be.